Search no more! 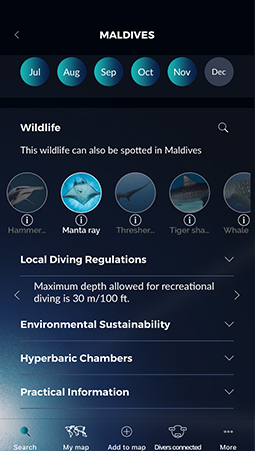 In just a minute, Scuba Calendar finds your perfect scuba diving destination based on the marine wildlife you wish to see at a specific time of the year. 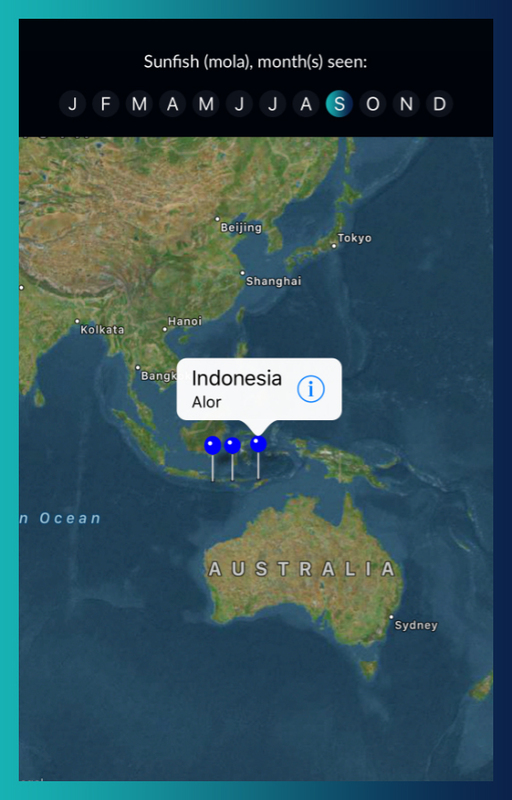 Record your exciting diving moments with your favorite animals in My Map. You can use photos, videos, or simply write notes. Then share them with other divers in Divers Connected. You want your kids to enjoy the same natural beauty in the future as you do today? 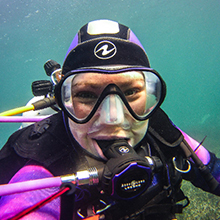 Help scientists by sharing your sightings and the environmental state of the dive location. 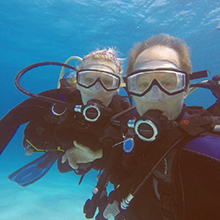 Or read the tips for sustainable diving. Select an animal you wish to see. You can also add a month and/or region. 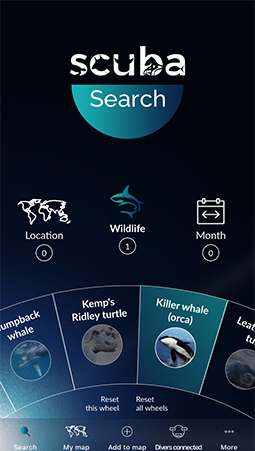 The app then determines the geographic locations where the chosen marine life can most likely be spotted. The Country Page shows the types and locations of marine life likely to be spotted in that country. It also lists local diving regulations, environmental sustainability tips, a list of hyperbaric chambers and more. 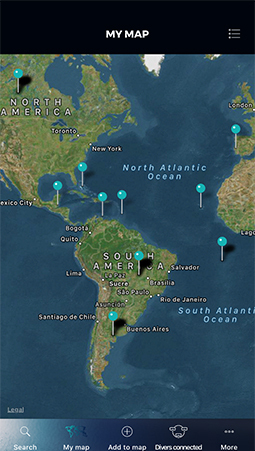 Keep track of your marine wildlife experiences on your own personal map. Add your sightings by selecting an animal, time of year and country. Take the opportunity to report on the environmental situation at the dive site (e.g. marine debris, corals in distress, etc.). 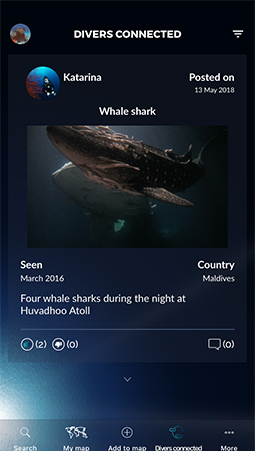 Divers Connected serves as a social platform for divers all around the world to share their experiences publicly. Check what other divers are logging and participate in building a database of sightings, which could help marine scientists in their research. Written in a fun and easy to understand way, this section will increase your knowledge about marine animals. Scuba Calendar helps to increase awareness about critical threats to oceans and their precious inhabitants. 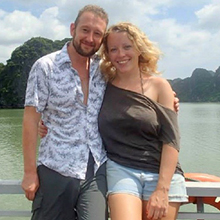 We hope it will inspire many of you to get involved in marine conservation! 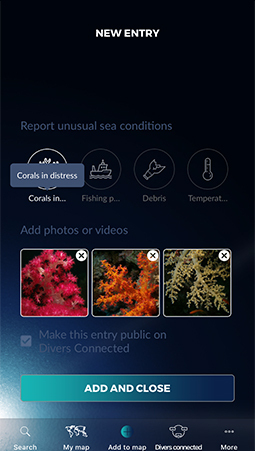 The Scuba Calendar app is an extremely useful and user-friendly app that allows all divers of all levels the ability to put specific animals, locations and dates at their fingertips. The usefulness of this app has no limits as the more users input new data from their own experiences the stronger the app becomes. It is truly the Facebook app for divers. Congratulations on bringing diving to divers from divers. We get it!! As divers and marine conservationists, we’re really happy to have found Scuba Calendar. 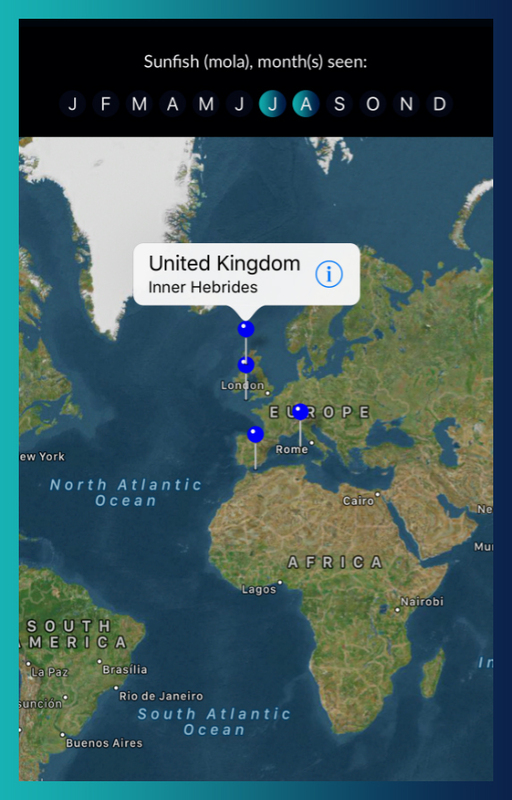 Not only does this app allow you to discover when and where to find your favourite sea creatures, it also lets you play a part in conserving them. Every time you see something cool under the water, you record the entry. This information then helps scientists gain a greater understanding of what is going on in the ocean right now. 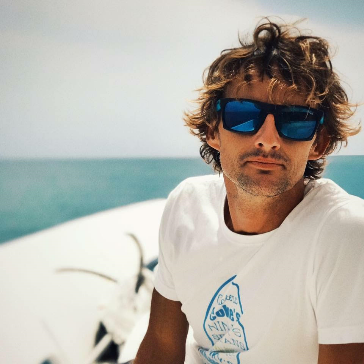 The more data that is collected, the greater chance there is of protecting the ocean in the future. I love the app because it helps me plan trips. For example if I wanted to go see mantra rays I can jump on the app and see where I can travel and when is the best time to go to see them. 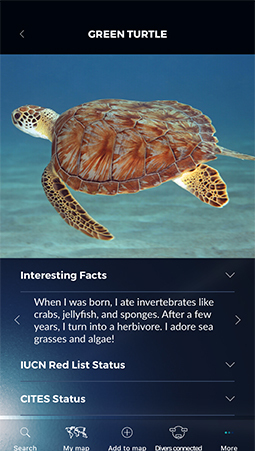 The best part about the app is it connects you to the underwater world through real divers, who upload their own photos and experiences with the marine life. Scuba Calendar is a trendsetter in the world of scuba diving apps! Fun, informative and educational, yet so simple to use.